The term ‘Neanderthal’ has become synonymous with the type of behaviour associated with ‘sluggish’, ‘brutish’ cavemen, and the term has entered the English dictionary as also meaning ‘an uncivilised or uncouth man’. Indeed, one online dictionary gives their definition of Neanderthal as meaning ‘crude, boorish, or slow-witted person’ and Neanderthaloid as ‘ill-mannered and coarse and contemptible in behaviour or appearance; stupid, oafish’ . This view stems from the academic, religious and public climate that saw the first Neanderthal discovery in 1856, three years before Darwin published his ‘Origins of the Species’, and which cultivated the image of the Neanderthal as a deformed sub-human. Marcelin Boule’s discovery of the ‘Old Man’ of La Chapelle-aux-Saints in 1908 seemed to confirm this brutish appearance and led to the popular stereotype we know today, despite later findings showing the Neanderthal was crippled by arthritis and disease. This century old stigmatism led to the reconstructions which we see from various publications through the 20th century, depicting Neanderthals as everything from walking monkeys with spears to hunched, shambling creatures. Only recently have the Neanderthals image started to be reassessed, with modern reconstructions portraying more accurate anatomical and cultural features, although academia is still divided on the subject of modernity and intellect. The language used to describe this period of time also contributes in some way to how we view Neanderthals and their contemporaries. Words such as ‘archaic’, ‘modern’, ‘pre-modern’ and ‘proto-human’ make us perceive Neanderthals as being somehow ‘sub-human’, unable to display the type of ‘modern’ behaviour which we associate with abstract thought, symbol use and manipulation. There is a note of surprise in the tone of articles when ideas such as burial, health care or symbolic thought are displayed by a Neanderthal site or find, as if this is somehow astonishing behaviour for hominids not of the ‘human’ sort. Headlines such as “Neanderthal hunters rivalled human skills” , “New Evidence of Neanderthal Violence” and “Grisly finds confirms Neanderthal cannibalism” exemplify the continuation of our judgemental view of Neanderthals. Even in today’s climate of modern academic debate and reasoning, it is hard for theories of Neanderthal behaviour and culture more typically associated with the early-modern human contemporaries, to be taken seriously. Most are vociferously debated and on the whole rejected, whereas similar evidence from early-modern human sites are believed with little of the same dispute. However, as more evidence comes to light, it is becoming harder to delineate between the behaviour of the Neanderthals and their contemporaries, and recent work is steadily demolishing the idea of the sub-human Mousterian man. These previous stereotypes however must be borne in mind when reviewing the evidence for and against Neanderthal culture and identical methods of examination and reasoning of the data must be applied to the Neanderthal evidence as for the early-modern humans. Shanidar cave is a particularly important Neanderthal site as it provides us with information pertaining to many aspects of the Neanderthals behaviour debate, especially with regards to the burial and ritual treatment of the dead, as well as of compassion and group concern. The cave site is located in the foothills of the Zagros Mountains in north-eastern Iraq and was excavated between 1957-1961 by Ralph Solecki and his team from Columbia University (Solecki, 1975, 880). The site yielded the first adult Neanderthal skeletons in Iraq, dating between 60-80,000 years BP which came from the Mousterian level of the site (Layer D), some 7.5m below the modern surface of the cave floor (ibid.). The excavated area produced nine skeletons of Neanderthals of varying ages, states of preservation and degree of completeness (labelled Shanidar I – IX) and were grouped into two very broad depositional stages. The first consisted of skeletons IV, VI-VIII and has been recently dated to between 70-80 kyr whereas the later group of burials (I, III, V) dated to around 60,000 BP were located higher up in the stratigraphy (Cameron et al., 2004, 221). There is no evidence to suggest whether or not any of the burials were contemporaneous with each other. The cave itself is located in a tectonically active area and the stratigraphic evidence suggest successive rock falls from the interior and ceiling of the cave which make it difficult to properly assess the depositional context of many of the skeletons (Gargett, 1999, 35). Fifteen metres of sediment had built up in the cave at Shanidar since the lowest Mousterian level and to get an idea of the rapid depositional environment, its roughly contemporaneous site of La Chapelle-aux-Saints only had 1m of deposition in the same amount of time (ibid; 36). All of the Neanderthal skeletons found on this site were discovered beneath collapsed bedrock or in natural niches, and accepted thought suggests that with the exception of Shanidar IV and possibly III, skeletons I, II, and V-IX lie in situ from where they were struck down by falling cave roof and therefore not representative of burial. The site is most famous however, for the controversial ‘Flower Burial’ of Shanidar IV, which was found associated with three other skeletons (VI, VII and VIII) and was located in a natural niche measuring just 90cm by 150cm (Trinkaus, 1982, 37). It was discovered in 1960 by Ralph Solecki and his team in Layer D of the site, correlating to the Late Mousterian period. The skeleton was that of an adult male, aged between 30 and 45 and was found 15m in from the cave mouth and appeared to be deliberately placed in a shallow grave of loose sediment in a foetal position on a bed of uncremated woven woody horsetail (Solecki, 1975, 880). The significance of the find however, was not discovered until 1968 when soil samples which had been taken from the burial were analysed by Arlette Leroi-Gourhan. These showed that there were significant ‘clumps’ of pollen in the samples either side and behind the skeleton on seven particular flower types, which suggest they entered the deposit as whole, flowering plants (Leroi-Gourhan, 1975, 563). Twenty other species were represented in the samples, which were found throughout the deposits in the cave and make up the normal cave deposition through wind, infiltration, human and animal action.The evidence seemed to point to the flowers being laid purposefully into the grave of the Shanidar IV individual and furthermore, study of the particular flower types suggested that the flowers may have been chosen for their specific medicinal properties. Yarrow, Cornflower, Bachelor’s Button, St. Barnaby’s Thistle, Ragwort or Groundsel, Grape Hyacinth, Joint Pine or Woody Horsetail and Hollyhock were represented in the pollen samples, all of which have long-known curative powers as diuretics, stimulants, astringents as well as anti-inflammatory properties (Solecki, 1975, 881). This led to idea that the man buried here could possibly have shamanic powers, perhaps acting as medicine man to the Shanidar Neanderthals. However, recent work into the flower burial has suggested that perhaps the pollen was introduced to the burial by animal action as several burrows of a gerbil-like rodent know as a Persian jird were found nearby (Klein, 2002, 194). The jird is known to store large numbers of seeds and flowers at certain points in their burrows and this argument was used in conjunction with the lack of ritual treatment of the rest of the skeletons in the cave to suggest that the Shanidar IV grave goods of flowers had natural, not cultural origins (Cameron, 2004, 220). Furthermore, it has leant ammunition to many scholars, Robert Gargett being a chief proponent, who argue that not only are the Shanidar burials a result of natural deposition, but so too are the great majority of Neanderthal burials found in south west Asia and Europe. Does the Shanidar IV burial therefore, like so many other Neanderthal burials from the Mousterian, provide evidence of intentional burial? Solecki specifically noted that the sediment surrounding the skeleton was much looser in compaction and composition than the surrounding area and that the body was positioned in a partially-foetal position, a common burial position throughout prehistory (Louwe Kooijmans et al., 1989, 324). Even if we accept that the evidence for the inclusion of flowers as burial goods is spurious, it still seems that Shanidar IV was intentionally deposited in a grave cut within the cave, and that throughout the Mousterian several other individuals were interred here. Gargett (1989, 1999) however, argues that all the burials of Shanidar are a result of death-by-rock-fall, and that all seven adults, the adolescent and the child, on separate occasions, entered the cave and were killed and buried by a rock fall in much the same way as most of the other potential Neanderthal burial sites such as Qafzeh, Dederiyeh Cave and Saint-Césaire. Evidence for this is visible in some of the skeletons which display indicative fractures and shattered bones, but it is difficult to delineate between when the rock falls covering some individuals happened, be it at time (and subsequently as cause) of death, or some time after the fact (Pettitt, 2002, 8). It has been put forward that as many of 7 of the 9 individuals found here are the result of burial, and that only II and V are the result of death-by-rock-fall that Gargett suggested and that Shanidar is one of large number of cemeteries such as La Ferrassie (Zilhão, 2002, 521). So what do these burials tell us about the behaviour and culture of the Neanderthals? The growing number of recognised Neanderthal burials and cemeteries that have been discovered and the very fact that these burials exist clearly indicate a change in the cognitive processes of the hominids during this period. Almost no complete, articulated skeletons exist before 100 kyr (with the notable exception of the Australopithecus aferensis ‘Lucy’ and Nariokotome Boy, a Homo ergaster) and it is difficult to accept that natural, geological processes are the cause for all complete burials before the Upper Palaeolithic (Zilhão, pers comm.). Neanderthal burials however, are relatively simple in contrast to those of the Upper Palaeolithic, with little or no grave goods and resemble those of the contemporaneous early modern humans (Klein, 1999, 468). This is not to say that there weren’t burial rituals and practices were not going on during this period, it merely suggests that they have not been preserved in the physical record and the age-old maxim of ‘absence of evidence does not constitute evidence of absence’ comes into play. As Speth notes in his 2004 article, we have no way knowing if singing, dancing, praying or any other number of ritual activities were undergone at burials. This type of behaviour will never be visible in the archaeological record and it is up to other observable indicators to provide the evidence for Neanderthal society and culture. Shanidar Cave, as noted above, is an important site because not only does it provide evidence for burial, but also for healthcare and group concern, a significant marker of modern human behaviour. Shanidar Cave’s most famous second inhabitant is an elderly Neanderthal male known as Shanidar I, or ‘Nandy’ to its excavators, who displayed a mosaic of health problems and deformities. He was aged between 40-50 years, which was considerably old for a Neanderthal, equivalent to 80 years old today, displaying severe signs of deformity. He was one of four reasonably complete skeletons from the cave which displayed trauma-related abnormalities, which is his case would have been debilitating to the point of making day-to-day life painful (Trinkaus et al., 1982, 61). At some point in his life he had suffered a violent blow to the left side of his face, creating a crushing fracture to his left orbit which would have left him partially or totally blind in one eye. He also suffered from a withered right arm which had been fractured in several places and healed, but which caused the loss of his lower arm and hand. This is thought to be either congenital, a result of childhood disease and trauma or due to an amputation later in his life (ibid.). The arm had healed but the injury may have caused some paralysis down his right side, leading to deformities in his lower legs and foot and would have resulted in him walking with a pronounced, painful limp. All these injuries were acquired long before death, showing extensive healing, with little or no sign of infection. The condition of Shanidar I is particularly notable because it suggests that Neanderthals cared for their sick and elderly, often prolonging their lives beyond their usual age expectation and making allowances for injuries and illnesses that would have left them huge burdens on the social group (Dettwyler, 1991, 379). Care of the sick and elderly is implicit of a deeper social bond which is seen little (if at all) in the archaeological record before this time and coupled with the evidence for the burial of the dead, shows a developing cognitive processes which more than hints at modern behaviour. Shanidar I is not the only Neanderthal at this site, or in the entire archaeological record which displays both trauma and healing either. Within the cave, Shanidar III also suffered from a degenerative joint disorder (DJD) in his foot, which would have resulted in painful, limited movement (Trinkaus, 1982, 38). Within the west Asian and European record there are five broad groups of pathology or injury noted in Neanderthal skeletons; fractures, trauma, degenerative diseases, hypoplastic diseases and infections. The high frequency of fractures and trauma (such as stab wounds) seen in a greater degree of Neanderthals than contemporary early modern humans suggest that they may have had a different hunting style (Klein, 1999, 475). This may have been much more ‘up close and personal’ and has been derogatorily compared to ‘wolves with knives’ by one scholar (Shea, 2001) and shows that perhaps their technology or culture was more ineffectual at reducing wear and tear on the Neanderthal body. Whatever the cause of the injuries sustained by many of the Neanderthals skeletons we possess, we have good evidence that most of them healed with little or no sign of infection, suggesting again that they were taken care of during times of incapacitation. 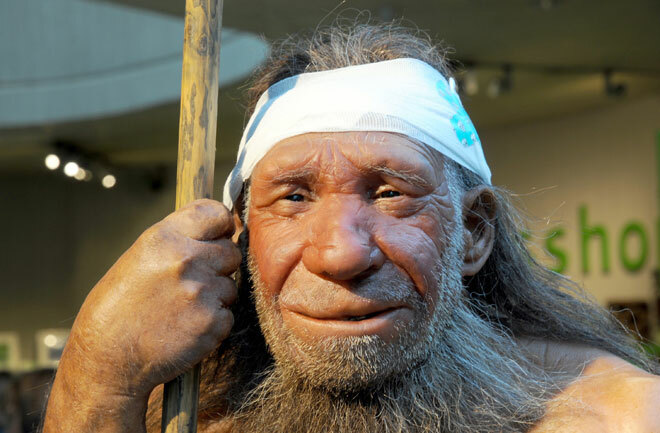 There is further evidence that Neanderthals took care of those with more long term health problems, such as Shanidar I and III which were connected to degenerative diseases and infections. Arthritis was a particularly common ailment in the older Neanderthal population, specifically targeting areas of articulation such as the ankle (Shanidar III), spine and hips, arms, knees, fingers and toes (Trinkaus et al., 1982, 75). This is closely related to DJD, which can range from normal, use-related degeneration to painful, debilitating restriction of movement and deformity and is seen in varying degree in the Shanidar skeletons (I-IV). Finally, inferences can be made into lifestyle of Neanderthals during childhood by studying instances of dental enamel hypoplasia, which are striations and grooves on the enamel teeth caused by periods of stress during the development of teeth (Ogilvie et al., 1989, 25). A study of 669 Neanderthal dental crowns conducted by Ogilvie and her companions showed that 75% of individuals suffered some degree of hypoplasia and that nutritional deficiencies were the main cause of hypoplasia and eventual tooth loss. 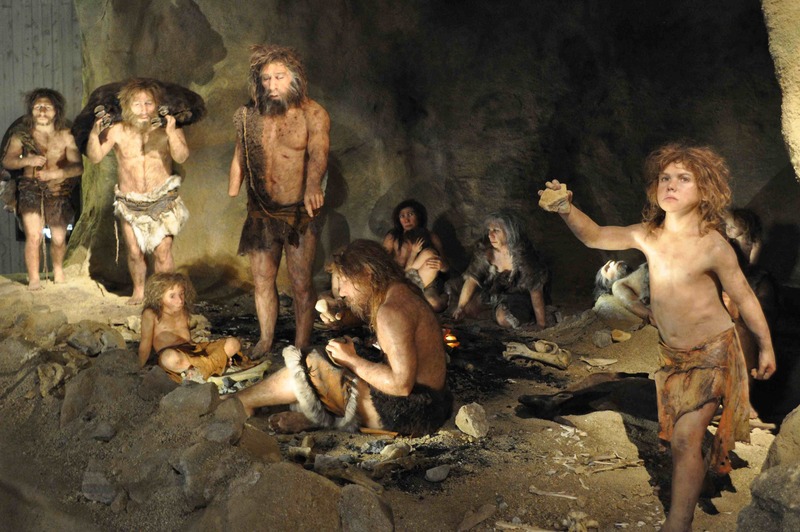 This suggests that during their developmental phase, Neanderthals experienced unbalanced diets, food scarcity, trauma and disease in a higher degree than their contemporary early modern humans. The Shanidar cave site in Iraq provides us with important evidence with regards to the nature of Neanderthal behaviour towards their sick, elderly and deceased. The multiple burials found at the site from a long period of interrupted use suggest that Neanderthals were burying their dead, perhaps not with grave goods as originally speculated, but with purposeful intent of interment. The continuing debate into the nature of Neanderthal beliefs, the instances of burial and the role which natural geological processes of taphonomy and deposition play are inextricably linked with the long-held biases cultured towards the species since their discovery over 150 years ago. From the evidence at Shanidar however, we know that Neanderthals had the ability and the desire to bury their dead, that they cared for the injured, sick and elderly of their social group and that from this we can speculate as to how they hunted and what their early childhood health was like. These findings are also of extreme importance to the continuing debate of Neanderthal behaviour, and the wider context of Palaeolithic study as we attempt to further delineate or subsume ‘modern’ behaviour into the hominids of the past 100 kyr in Europe, Asia and Africa. It is obvious that there will never be an easy answer to the Neanderthal debate, but the evidence of burial and healthcare and the inferences made from these can go some way to illuminating this dark area of palaeoanthropology. Klein, R., 2002, The Dawn of Human Culture, John Wiley & Sons, Inc.
Zilhão, J., and Trinkaus, E., (edtd. ), 2002, Portrait of the Artist as a Child: The Gravettian Human Skeleton from the Abrigo do Lagar Velho and its Archaeological Context, Oxbow Books Ltd.
Perhaps flowers were placed with the dead to mask the odor of the corpses. Great post, very informative. ! !